One of the hallmarks of the 4th generation of bike-sharing will be the single transportation card. A pass that is operative on the bus, metro, tram, light rail, taxis, car-sharing and car parking. We wrote about the experiment with the Mobilitätskarte (Mobility Card) of Berlin in our Bike-sharing World -- June 2011 as a step in this direction. Another hallmark will be an inter-operative card between bike-sharing systems. 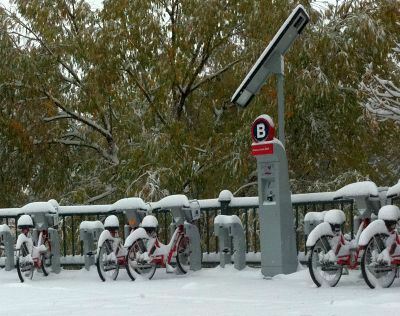 A good example is Boulder B-cycle members can use Denver B-cycle and visa-versa. In Germany, a registration, by card or telephone, with Metropolradruhr or nextbike will work in all their locations. Bicincittà is in the process of making all their bikes available to all their card holders. 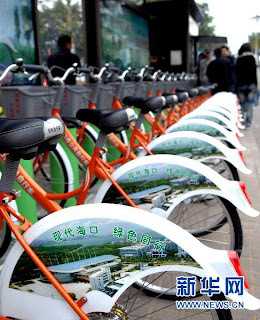 Last week, the bike-sharing service in Wuhan, China (currently the largest in the world with 5,000 more bikes than Hangzhou) announced an intent with the bike-sharing service in Haikou, China to give reciprocity to each other's card holders to use each other's system. Wuhan is in central China on the Yangtze River and has harsh winters. Haikou is on a large island in the South China Sea with warm winters. According to reports by the Chinese Bicycle Association, the intent is to allow leisure and business travelers to enjoy bike riding in the tropical climate of this ocean city! What a complementary pair of services. This conjures up whole new avenues for bike-sharing. The systems of Scandanavia, such Stockholm City Bikes, could have reciprocity with Barcelona's Bicing with less harsh winters. The Polish system in Rzeszow, RowRes, could exchange with Batumivelo on the Black Sea. B-cycle in Madison, Wisconsin could let its University of Wisconsin members enjoy spring break with B-cycle in Ft. Lauderdale, Florida in the USA. As bike-sharing becomes more universal and technology takes bike-sharing into the 4th generation, these types of member-sharing across different manufacturers of systems will be common. If two of the largest cable television competitors in the US, Comcast and Verizon, can come together to service mobile telephone subscribers, bike-share companies, and in some cases their municipal owners, can come together to service their subscribers also.